This 24 hour Missouri POST certified course teaches Tactical Emergency Medical Support (TEMS) from basic to advanced emergency medical skills for law enforcement and military personnel including the latest medical standards as established by the Committee on Tactical Combat Casualty Care (TCCC). During this course students will develop and apply injury control strategies while applying law enforcement principles to deliver emergent medical care. Students will participate in several practical application and scenario based exercises utilizing protocols and standards developed by TCCC and the American College of Surgeons Pre-Hospital Trauma Life Support. 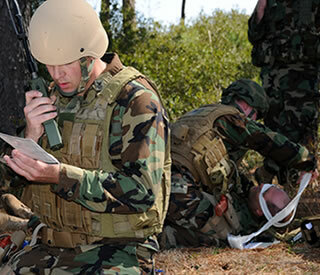 During the course the student will be taught the principles of care under fire, tactical field care and medivac / cold zone management in law enforcement and military operations.